Welcome to Jubilee Destiny Ministries website. This site contains information on the apostolic-prophetic ministry of Roger & Charlotte Merschbrock. Who would have thought that a 50th Wedding Anniversary would change the entire direction of a ministry! That’s what occurred with the Merschbrock’s in 2014! Our original mandate remains–disciple the Body of Christ, network leaders, and strengthen and equip the prayer army for reformation and transformation. But we’ve been commissioned anew with a passion to see God’s people awakened to covenant, identity, destiny, and inheritance through Him! We pray this site will be an effective tool for advancing His Kingdom and helping to align and mobilize the Body of Christ in Louisiana, the nation, and the nations! 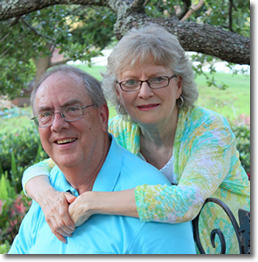 Roger & Charlotte Merschbrock are co-founders of Jubilee Destiny Ministries of Natchitoches, Louisiana, which transitioned from Prayer Focus Ministries in October of 2014. They were commissioned by Dr. Charles Pierce and are aligned with Global Spheres International Ministries, Corinth, Texas. Prior to founding Prayer Focus in 2000, they pastored churches for over 20 years. Roger has a degree in business from Mary Hardin-Baylor University and an MRE from Southwestern Baptist Theological Seminary. He was also active in the marketplace as a realtor in Austin, Texas from 1962-1975. Roger & Charlotte have served on numerous ministry boards and are State Advisors for Louisiana Aglow. Charlotte has served as president of an Aglow chapter and has co-sponsored a number of unity conferences for women. She counseled for eight years at the Natchitoches, LA Crisis Pregnancy Center, organized citywide prayer for government officials, and co-organized a local pastor’s wives fellowship. Jubilee Destiny is an apostolic, prophetic ministry that is being used to equip and release the Body of Christ to walk in the fullness of their destiny and inheritance! They minister in churches and conferences, facilitate other ministries, and network apostolic leaders and intercessors for mobilizing God’s “triumphant reserve.” They have served on prayer teams to help shift the spiritual atmosphere toward harvest and reformation through prophetic intercession and strategic warfare in their state, the nation, and the nations since the mid-’90’s. They oversee the Louisiana Apostolic Prayer Network, a ministry that serves to inform and connect apostolic leaders and intercessors in Louisiana. Since 2004 they have been networked with apostolic leaders in Western Europe for the advance of Kingdom objectives and to see revival and re-reformation in these nations and in the US. They also oversee and coordinate prayer for the international missions ministry of Global Advance in Rockwall, Texas. Global Advance has a mandate to put vision in the hearts and tools in the hands of indigenous church and marketplace leaders in developing nations for the advance of the Gospel worldwide. Roger & Charlotte’s heart in this hour is to be used of the Lord to help father and mother the body of Christ. They want to see true spiritual sons and daughters of the Kingdom raised up to walk in the fullness of their identity and fulfill God’s covenant plan in the earth. Their ministry together is an example to the body of Christ of a husband-and-wife team working in tandem and unity to accomplish God’s purposes. When they are invited to minister in churches and conferences, one of their greatest joys is to “team teach” and help other couples operate in the fullness of their gifts and callings. They also have a heart to bless God’s covenant people, Israel, and to help the Body of Christ come into that position as well. Roger & Charlotte have been married for 50 years and have two grown daughters and four grandchildren.